Glutaric aciduria type 1 is an autosomal recessive disease with typical imaging features. Incidence is 1 in 40,000 live births; but can be as high as 1 in 300 in certain inbred populations. Greater awareness about this condition among clinicians and radiologists is essential for early diagnosis and prevention of its catastrophic consequences. To the best of our knowledge, MR imaging of different stages of striatal necrosis in siblings has not been described previously. Striatal necrosis with stroke-like signal intensity on imaging correlates with clinical stage of patients. Two siblings born of a consanguineous marriage with history of neurologic deterioration were imaged. The younger (1-year-old) child presented with regression of achieved milestones after an acute encephalopathy episode associated with a respiratory infection. The elder (6-year-old) child had similar neurological problems since infancy; he had undergone VP shunting for "subdural collections," with no clinical improvement. Imaging of elder child showed a VP shunt [Figure 1]a and b that had been inserted to drain "subdural effusion," widened sylvian fissures [Figure 1]b, d-f, dilated CSF space anterior to temporal lobes [Figure 1]a, loss of volume in striatum with a small area of T2 hyperintensity in putamen [Figure 1]d, and diffusion restriction [Figure 1]e and f.
Imaging of younger child showed widened sylvian fissures [Figure 2]a, dilated CSF space anterior to temporal lobes [Figure 2]c, T2 hyperintensities in the dentate nucleus [Figure 2]b, pons [Figure 2]b and c, periventricular white matter [Figure 2]c-e, caudate nucleus [Figure 2]d and e, lentiform nucleus [Figure 2]d and e. Caudate nucleus and lentiform nucleus showed extensive hyperintensity on diffusion images. Imaging features are classical of glutaric aciduria type 1, acute (striatal necrosis) stage in younger sibling and chronic stage in older sibling. Urine screening for aminoaciduria was negative in both children. Type 1 glutaric aciduria is an autosomal recessive disease with genetic heterogeneity (caused by many mutations) and phenotypic variability (severe and mild forms of the disease may be seen even in the same family). High incidence is seen in the Palestinian, Amish, Greek, and Canadian Indian populations, reflecting the historical tradition of marriages within extended kindreds. Deficiency of glutaryl CoA dehydrogenase enzyme leads to elevation of glutaric acid and 3-OH glutaric acid. Dystonia and psychomotor regression are the predominant symptoms. The symptoms appear after an asymptomatic period during the first months of life. It may present chronically and insidiously or acutely as metabolic encephalopathy during a banal infectious condition or vaccination. Microencephalic macrocephaly at birth is the earliest sign of GA1. Rarely, adult onset glutaric aciduria type I presenting with leukoencephalopathy has been reported. Treatment with carnitine, protein restriction, and early approach of the hypermetabolism conditions has been shown to be effective in decreasing the encephalopathy episodes in the first years of life. Neonatal screening programs for glutaric aciduria type I have been established in some countries with high prevalence using analysis of glutarylcarnitine in dried blood spots by tandem mass spectrometry. Due to risk of missing patients with a mild biochemical phenotype (i.e., low excretors), a binary strategy - using glutarylcarnitine as a primary variable and glutarylcarnitine/acylcarnitine ratios as a secondary variable - to improve the diagnostic sensitivity and specificity of neonatal screening is proposed. In patients, urinary excretion of glutaric, 3-hydroxyglutaric and glutaconic acids may be elevated. If there is suspicion of glutaric aciduria, glutaryl-coenzyme A dehydrogenase should be measured in skin fibroblasts or interleukin-2-dependent lymphocytes even if glutaric acid is not increased in the urine. Hyperlactacidemia, hyperlactatorrachia, mitochondrial abnormalities in muscular cells and a deficiency in complexes I and IV of the respiratory chain in isolated mitochondria from muscle have been reported in GA-1. Subdural hemorrhage with/without retinal hemorrhage due to stretched bridging veins may be an initial sign of glutaric aciduria type 1 and can be a diagnostic pit fall , since post-traumatic and nonaccidental causes have to be excluded. Acute striatal necrosis during infancy is the principal cause of morbidity and mortality and leads to chronic oromotor, gastroesophageal, skeletal, and respiratory complications of dystonia. Between birth and 18 months of age, with a peak at 14 months, 90% of untreated children with GA1 suffer an acute neurological crisis precipitated by an infectious illness. A depressed consciousness and profound axial hypotonia (behavioral arrest) may be accompanied by seizures or dystonic extremity movements. The relatively abrupt neurological deterioration coincides with swelling, metabolic depression, and necrosis of basal ganglia gray matter, especially the putamina. Adequate treatment reduces the incidence of radiologically and clinically evident basal ganglia injury significantly (from approximately 90-35%). Acute striatal necrosis can be visualized as focal, usually symmetric, stroke-like signal hyperintensity on T2- and diffusion-weighted magnetic resonance imaging (MRI), bilateral striatal lucency on computed tomography (CT), or a sharp decline of fluorodeoxyglucose uptake imaged by positron emission tomography (PET). Diffusion-weighted MR imaging has been known to show more extensive disease than was apparent either on CT or on the conventional MR images. Over ensuing weeks, circumscribed and near-complete degeneration of the putamina occurs with variable extension to the caudates and pallidi. Neural tissue is replaced by a thin gliotic scar and the resulting dystonia is irreversible, static, and severe. When there is a family history of GA-1, prenatal diagnosis at 11 week's gestation through chorionic villus sampling  can be done if the responsible mutation is known. Later in pregnancy, ultrasound  and MRI  can diagnose GA-1 in suspected cases. Progressive dilatation of the quadrigeminal cisterns associated with macrocephaly, fronto-temporal atrophy and wide space of perisylvian fissure were found in the follow-up scans when parents decided to continue pregnancy in affected cases. Timely diagnosis and start of therapy (preferably in the presymptomatic phase) are essential for the prevention of irreversible brain damage. 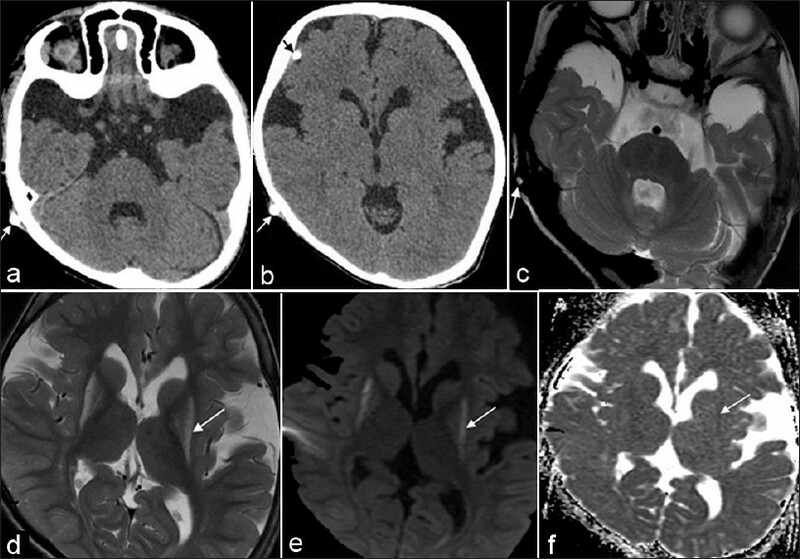 Greater awareness of glutaric aciduria among pediatricians, neurologists, neurosurgeons, and radiologists is key to (a) avoiding misdiagnosis as bilateral subdural collections (which may be unnecessarily drained) or nonaccidental injury (which has important sociological and legal implications) (b) early diagnosis so that proper neurological development for affected child can by ensured by early diet modification, and (c) genetic counseling of parents regarding future offspring. 1. Twomey EL, Naughten ER, Donoghue VB, Ryan S. Neuroimaging findings in glutaric aciduria type 1. Pediatr Radiol 2003;33:823-30. 2. Strauss KA, Donnelly P, Wintermark M. Cerebral haemodynamics in patients with glutaryl-coenzyme a dehydrogenase deficiency. Brain 2010;133:76-92. 3. Woelfle JJ, Kreft BB, Emons D, Haverkamp F. Subdural hemorrhage as an initial sign of glutaric aciduria type 1: A diagnostic pitfall. Pediatr Radiol 1996;26:779-81. 4. Fernando S, Obaldo RE, Walsh IR, Lowe LH. Neuroimaging of nonaccidental head trauma: Pitfalls and controversies. Pediatr Radiol 2008;38:827-38. 5. Strauss KA, Morton DH. Type I glutaric aciduria, part 2: A model of acute striatal necrosis. Am J Med Genet C Semin Med Genet 2003;121C:53-70. 6. Elster AW. 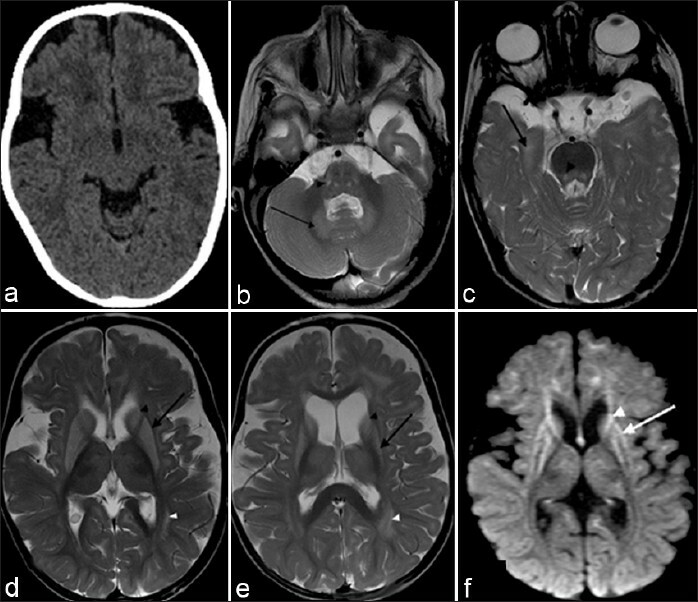 Glutaric aciduria type I: Value of diffusion-weighted magnetic resonance imaging for diagnosing acute striatal necrosis. J Comput Assist Tomogr 2004;28:98-100. 7. Strauss KA, Lazovic J, Wintermark M, Morton DH. Multimodal imaging of striatal degeneration in Amish patients with glutaryl-CoA dehydrogenase deficiency. Brain 2007;130:1905-20. 8. Lin SK, Hsu SG, Ho ES, Tsai CR, Hseih YT, Lo FC, et al. Novel mutation and prenatal sonographic findings of glutaric aciduria (type I) in two Taiwanese families. Prenat Diagn 2002;22:725-9. 9. Righini A, Fiori L, Parazzini C, Doneda C, Arrigoni F, Riva E, et al. Early prenatal magnetic resonance imaging of glutaric aciduria type 1: Case report. J Comput Assist Tomogr 2010;34:446-8.